David De Gea was called into action once again in the 76th minute of the clash between Manchester United and Leicester, the Spaniard denied Rachid Ghezzal. Manchester United have David De Gea to thank once again after he made a stunning save to stop Rachid Ghezzal’s free-kick from hitting the back of the net. The Spaniard scrambled across his goal to tip the ball over the bar, Ghezzal’s audacious long-range free-kick was inches away from going in. 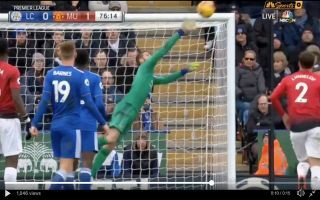 De Gea was on his toes to stop Jamie Vardy’s bicycle kick from hitting the back of the net earlier in the game. Check that out here. What a save from De Gea! ? Leicester will be kicking themselves tonight, but there really was nothing more that the Foxes could do today, De Gea was just up to his usual heroics and he wasn’t going to let the clean sheet slip this afternoon it seems.